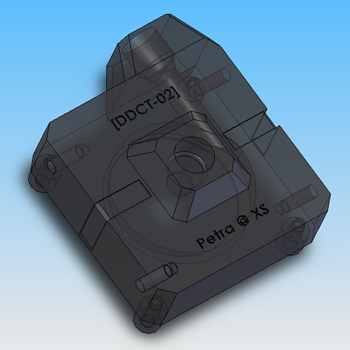 I teased you guys with images of my DDCT-02 pump top design when I created the Open Cooling Initiative page about a year ago and not much has happened with it since then. I've come to the realization that there's little point in me continuing to withhold the design as it's unlikely that I'm going to venture back into manufacturing cooling parts. It's time for me to let go. You can click the Open Cooling Initiative link at the top of this page to download the SolidWorks 2006 part file. Update: At the request of a member of XtremeSystems, a .STEP version of the DDCT-02 has been added to the OCI page. You may recall the home entertainment Z-2300 subwoofer modification project that I discussed in my previous post. Well, I completed the investigation, modification, and have been using the setup for a few weeks now and have found it to work rather well--I'm no audiophile and I'm sure there are folks out there who would consider the use of this subwoofer heresy, but I'm happy with it. The somewhat unfortunate news, however, is that my tinkering with the help of a function generator revealed that this modification didn't need to be nearly as elaborate as I had originally anticipated. 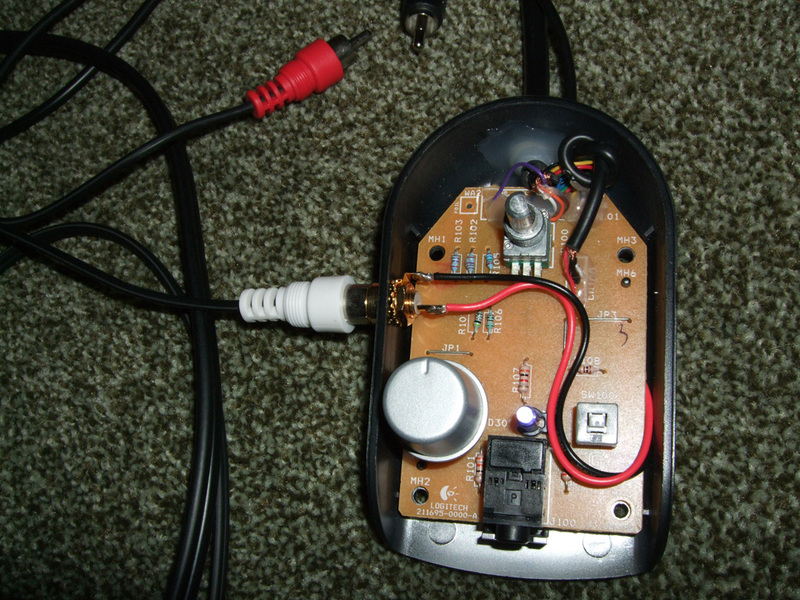 My investigation began by connecting an old function generator to the Z-2300's mini-jack input via a series of adapters. 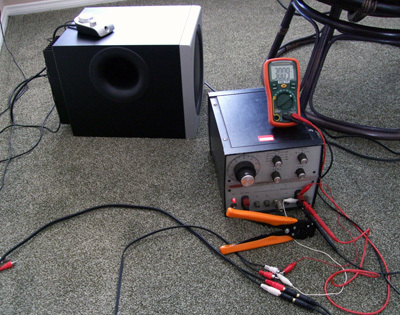 The purpose of the adapters was, primarily, to take the monaural output of the function generator and feed it into both the Z-2300's left and right channel inputs (reason being that loss of either channel would result in a decrease in signal amplitude feeding the subwoofer). With the satellites disconnected, I started running the function generator through various frequency ranges in hopes of determining where the subwoofer's built-in crossover filter would kick in... eventually I found that the subwoofer became mostly inactive at around 500Hz (which is quite high for a subwoofer). For this particular project, that meant that it really wasn't necessary to bypass anything within the speaker/amplifier/subwoofer setup due to the AVR's programmable crossover filter having an upper limit of around 250Hz. In retrospect, it makes sense that Logitech would set the subwoofer in the Z-2300 speakers to respond to a rather wide frequency range--the drivers in the satellites are very small and you've got to make up for that somehow. 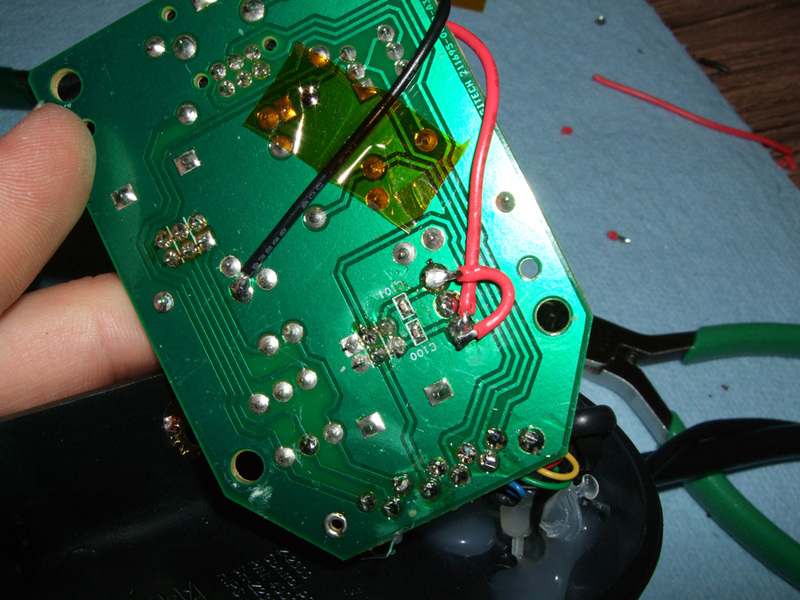 Armed with the above information, I disassembled the Z-2300's control puck for the purpose of installing an input jack which would make the chain of adapters I was using during testing unnecessary. 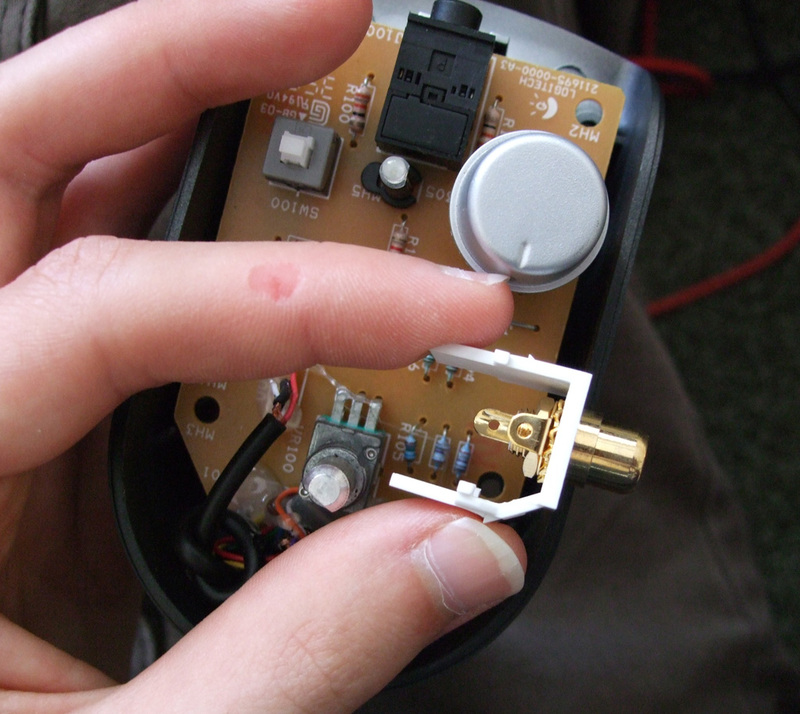 The puck comes apart easily, requiring only the removal of a few screws which are hidden under the puck's rubber feet (heat the feet with a heat gun or hair dryer prior to removal so that you avoid damaging the adhesive and heat the feet again before reinstalling them to ensure proper adhesion), removal of the main volume knob (pulls off), and removal of a nut that you'll find surrounding the base of the main volume knob post. Next up was the installation of a single composite/RCA input jack into the side of the puck housing (drill appropriately sized hole, attach panel mount connector). Finally, a wee bit of soldering. The above photos will probably be more useful to most people than a written description, but... the basic idea is that you want to solder the input connector's negative post to one of the many ground pads on the PCB (black wire) and the input connector's positive post should be connected to both the main left and right channel input pads on the PCB (red wires). 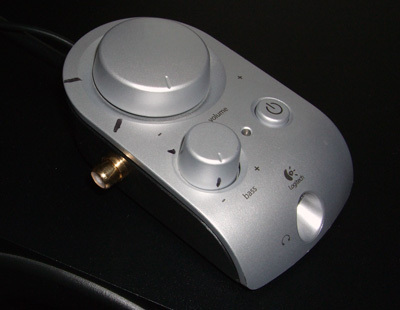 The useful part of not bypassing any of the volume knobs is that the main volume knob and bass volume knob basically become coarse and fine adjustment knobs for the subwoofer (this comes in handy when working with the Denon AVR-891's Audyssey setup tool). 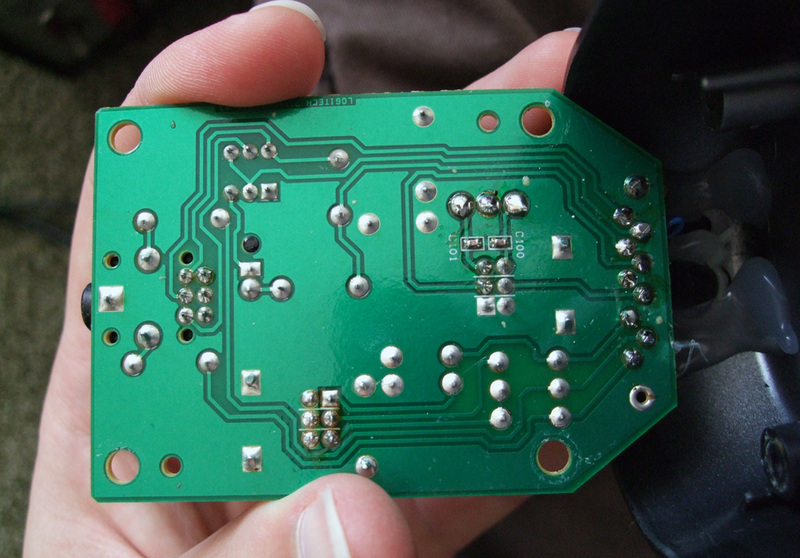 Pay no attention to the Kapton tape and various other solder marks on the PCB in the photo... I was doing some experimentation that didn't turn out as planned. The finished product, ready to be connected to the AVR's subwoofer pre-out. Do keep in mind, though, that the Z-2300's satellite speakers should not be plugged back into the system at this point and the system's mini-jack input should be insulated to prevent shorts (I just stuck some heatshrink over the end) and tucked away someplace safe. Could you remove the mini-jack input tail entirely? Of course, but I decided against it to reduce the amount of work required to reverse the modification. First up, I'd like to apologize to all of the [five] people who read this blog for not getting those CES galleries uploaded back in February... The downtime I was expecting never happened and, instead, I ended up with a house to deal with. 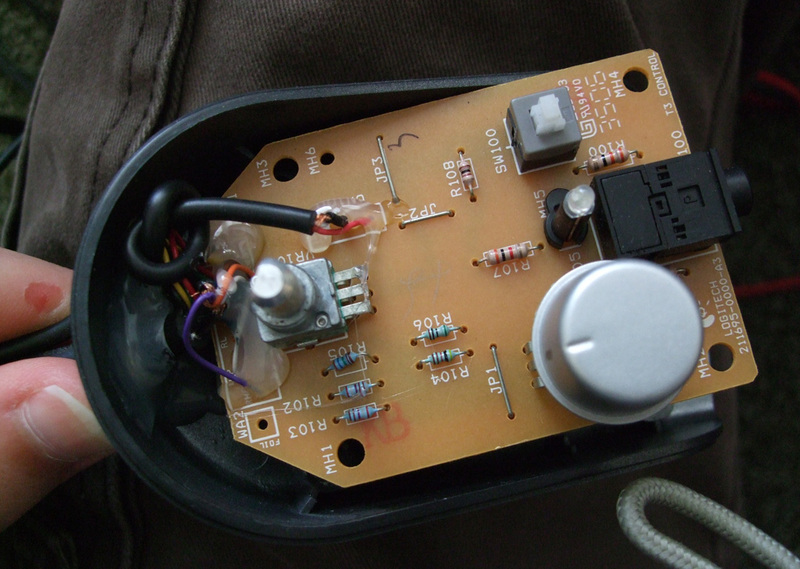 With that said, I have a small audio project coming up that I'll be posting to the blog as a how-to/DIY investigation. I'm doing another living room entertainment system upgrade and have a Panasonic TC-P50ST30, Denon AVR-891, and two Polk Audio Monitor60 Series II speakers on the way. The plan is to have the AVR-891 handle all of the A/V switching, processing, and scaling: all analog and digital video sources will be upscaled to 1080p for transmission over a single HDMI cable from the AVR to the PDP (unless they already are 1080p signals, in which case the AVR will process the audio and function as a simple video pass-through), all surround sound audio (be it Dolby 5.1 or whatnot) will be downmixed to a standard 2.1 signal, and all input management will [finally] be accomplished via remote. So, where's the project here? Well, seeing as how I'm somewhat cheap, the project will be modifying a spare set of Logitech Z-2300 THX 2.1 speakers to interface with the AVR-891's subwoofer pre-out and compliment the Polk Audio Monitor60s' lack of low frequency oomph. From what I can tell thus far, I should be able to bypass the Z-2300's left/right mini-jack input and feed the AVR's sub pre-out directly into the audio circuit just before the subwoofer's volume control knob, but just after the part of the circuit where the left and right channels are combined to create a monaural signal for the sub. This approach will bypass the main logarithmic volume knob and the TDA7296 power amplifiers that drive the satellites, but I have yet to pull everything apart and determine if it would also bypass the unit's crossover filter (which would be preferred, since the AVR-891 has a software configurable crossover for its sub pre-out). Bypassing the crossover in the Z-2300's subwoofer would make sure that I don't run into any issues when experimenting with the AVR-891's automatic equalizer feature (which uses a tethered microphone to adjust EQ values to match a room's acoustic characteristics and the characteristics of all connected speakers). More to come in a week or so! That's right, I'm in Las Vegas for CES for the third year running... This time, however, I'll actually be taking photos, shooting video, and uploading it for your guys!